ALF Weekend Fall 2015 is over, the work has been done, and now it is time to write some blog posts. I am doing a post in two parts focusing on the outcomes and the organization of the weekend. This post will cover how the weekend was organized, what worked, and what could have been better. You can see the debrief on what actually happened over on the ALF blog. In the weeks leading up to the ALF Weekend, @rochellehudson was attempting to organize space to host ALFs for the weekend. Ten days prior to the start of ALF Weekend @abbyo set up a Trello Board to begin capturing project ideas that were being discussed on a Monday Call. Six days before the opening of ALF Weekend I began organizing in ernest by setting up a structure and schedule. The first ALF Weekend in Fall 2014 took place at in upstate NY where most of our network met in-person (read @nancy’s account on her blog). For me it was a powerful community building time; it was the first time that I hung out with my fellow ALFs outside of the intense ALF Summer. It was much more focused on looking in, strengthening our bonds, and developing our network. Take Away: In-person events are the best way to experience an ALF weekend, if possible. The Fall 2015 ALF Weekend wasn’t able to coordinate a shared physical space. In our reflections, there was agreement that–save a large network gathering–the next best thing is to have regional gatherings. If possible try to organize local space to co-work and collaborate for—at least some of—the ALF Weekend Days. Are you able and willing to travel to [location], for this weekend? If you can’t travel to [location], do you still plan to work on network projects virtually that weekend? How much would you be willing to pay, per night, for an in-person retreat? Other than the cost of lodging, how much $ could you put toward food & other expenses we could share? Checklist: Try and gather this information from the network early! Get an idea of the cost, location, and logistics needs. There is always lots to do around the network and in local communities. Start to visualize this early! Abby took the initiative to create a Trello Board with two main lists, one for network projects and another for local projects. After hearing people say “we should do that at ALF Weekend” she created a space to hold those intentions. Checklist: Create a container to hold ALF Weekend intentions. Then begin adding (and asking people to add) intentions as cards. Use labels to denote Network and Local ideas for work. I will go into more detail on how to organize a Trello Board later. With less than a week before the start of ALF Weekend I didn’t see much more movement (aside from Rochelle and Abby) to schedule the time and projects. So I just took a stab at it. Admittedly I could have reached out for support. Really I also should have started the process much earlier. Take Away: Start organizing a framework for the weekend early so there can be more feedback and buy-in from the community. Added a section about how the Trello board worked. Simplified the schedule and put it at the top. Introduction, if people will be taking on roles, make them explicit, share important links at the top. Create clear expectations, one of the major take aways from this weekend was the need to make explicit that if you say you are going to be somewhere then you will be expected to be there. This can be supported by a clear schedule which I’ll go over later. Schedule overview, outline the structure of each day. If all the days will share the same structure then simplify it. Introduce projects, give people an idea of some projects that will be worked on. Checklist: Set up communication infrastructure. Because this was a mostly online event I figured that we might need extra space to meet virtually. We have a dedicated Google Hangout video conference room for meetings, but if people were working on projects at the same time that would get problematic. I was also worried that if people set up their own hangouts there would be confusion over who was where doing what! These links should still work far into the future, so no need to set up more unless you want to! I expanded Abby’s Trello Board to include lists for each session so people could move cards into specific time slots. I also added labels to give cards a visual color marking to indicate information about them. 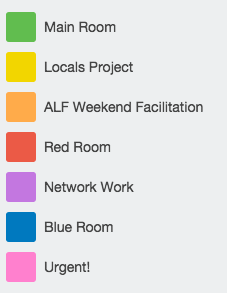 Section of the ALF Weekend Trello Board. Unscheduled Topics: list of cards that haven’t been scheduled. Cards that didn’t get worked on got moved back to this list. Don’t know what to do? Do this! : This list was added mid-weekend to hold cards that could be worked on without much prompting. Happening NOW! This list held cards that were currently being worked on from the sessions. Session Lists: These lists were for each session (as pictured above) when a session ended cards were moved off and the session list was archived. Pend until… This list holds cards that need additional work at a later date. Done! And ready to be blogged about 😉 This list is for finished cards/projects! At the top of each session list I added a card called RSVP with the session time and date. I requested that people add their names to a checklist on each card to indicate when they were coming. This might have been too overly complex… people took to adding cards into sessions saying that they weren’t going to be there or were going to be late, so you might want to pave those cow paths when you do this. Again, this was all a little bit over designed. I’m sure it could be remixed to be more lean. A note on timing, I chose the start and end times to account for the wide variety of time zones ALFs are coming from. The Afternoon session starts at noon on the west coast and 10am in Hawaii, take this into account when planning your ALF Weekend to be inclusive! A note on breaks, the idea behind having a mid-session break was 1) to make space for people to take care of themselves, stand up, move around, etc. 2) to make space for people who were late to integrate into the session. The idea was to have people check back into the main hangout before leaving to take care of themselves. Overall there was a positive response to this configuration and in the first few days there was a lot of participation. However it dropped off as the weekend went on (well, we started Thursday, so by the time the weekend actually came…). The feedback I got was that people burnt out showing up to session SCRUMs to find that the people they wanted to work with weren’t there. Though, I think more shorter sessions might also work, you should mix it up! Take Away: Have a Set-the-Weekend meeting to establish clear expectations of participation and planning when projects will be worked on. Next time: Have everyone commit to sessions they will attend first! Document who will be at what sessions and hold each other accountable. SCRUM! 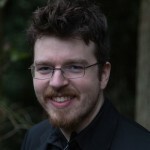 Start moving projects into session slots, set specific times if need-be. Long form Check-ins, we saved our check-ins for the end of the meeting to give everyone more time to talk. Each of us went around and discussed what we were doing in the network and/or our local community. We used this time to bond and share our successes with people we maybe haven’t seen in a while. Remember: ALF Weekend is also about community building! Checklist: Schedule a Set-the-Weekend meeting well in advance! This is probably the most important meeting of the whole weekend, especially if it is virtual! Facilitating session SCRUMs. Making sure trello cards get moved and that people are aware of what is going on. Facilitating session breaks. Make sure late comers are brought up to speed on what’s going on. Facilitating session reflections. Make sure work is documented and cards get moved. Send end-of-day recap. I sent out an email at the end of each day that went over everything that had been worked on, this helps keep people too busy in the loop. Checklist: Assign people these roles. I see this blog post and the one that will follow it as key to this (or any) event. I want other ALFs to feel empowered to take on this kind of responsibility which is why I try and make explicit what and how I do things. If you are reading this with the intention to organize an ALF weekend or similar event I hope you find this useful and I also hope that you remix this! Have any ideas for additions to this document? Comments, criticisms, or praise for the organization of ALF Weekend? Share it in the comments below. A big thanks to everyone who made ALF Weekend awesome this year!